Rudolph or Rudolf (Latin: Rodulfus, French: Rodolphe; c. 890 – 14/15 January 936) was the elected King of France from 923 until his death in 936. Prior to his election as king, he was Duke of Burgundy and Count of Troyes from 921. He was the son of Richard, Duke of Burgundy, and Adelaide of Auxerre, and inherited the Duchy of Burgundy from his father. 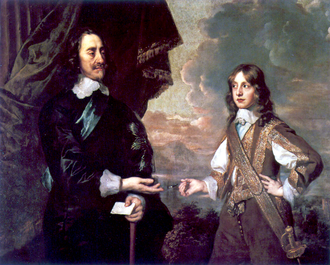 He married Emma of France, daughter of king Robert I of France. He is frequently confused with his uncle Rudolph I of Burgundy. Rudolph was elected king of West Francia in 923 by an assembly of Frankish nobles, to succeed his father-in-law Robert I who was killed at the Battle of Soissons against the deposed king Charles the Simple. 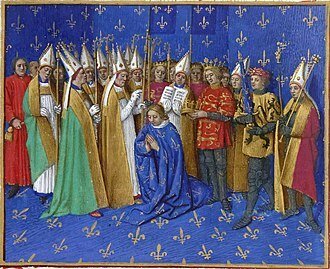 He was crowned by Walter, Archbishop of Sens at St.Médard in Soissons on Sunday, 13 July 923. On assuming the crown he passed the Duchy of Burgundy to his younger brother Hugh the Black. In contemporary Latin documents, his name is usually Rodulfus, from the Germanic roots hruod, "glory", and wulf, "wolf". Rodulf and Rudolf are variants of this name; the French form is Rodolphe. By contrast, the king is normally known as Raoul in modern French, a name which derives from Radulfus, from Germanic rad, "counsel", and wulf. Although this name is of different origin, it was sometimes used interchangeably by contemporaries with Rodulfus. The king himself, however, always used Rodulfus, as on his personal seal. Nonetheless, he is sometimes called Ralph (from Raoul) or Radulf in English. The deposed Charles the Simple was still alive and claimed the throne. This was solved when Rudolph's brother-in-law, Herbert II, Count of Vermandois, who was married to Emma's sister, tricked Charles, a fellow Carolingian, into meeting and then took him prisoner. Rudolph's first act was to lead an army against the king of East Francia Henry the Fowler, who had made a pact with King Robert I at Jülich earlier in the year. After trying to annex Lotharingia Henry met Rudolph with a considerably-sized army and made peace again. However, in 925 Henry attacked Gilbert, Duke of Lorraine and took over Lotharingia permanently, Rudolph being in no position to resist. 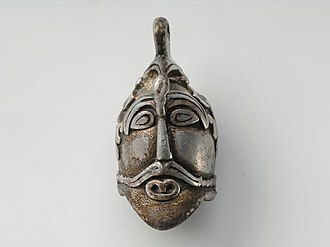 In 924 Vikings made a fresh series of raids into West Francia. From the Loire Valley they threatened Hugh the Great, brother of Queen Emma, but Rudolph did nothing. Soon they attacked Burgundy, the domain of Rudolph's brother. They were repulsed, and moved on to Melun, where they threatened the royal lands. Joined only by his ecclesiastic vassals and Herbert, he recruited troops in Burgundy, while Hugh the Great was convinced to join him. 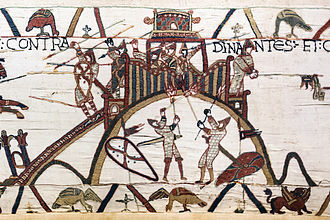 After the Vikings left, the Normans, whom Charles the Simple had settled in Duchy of Normandy in 911, began ravaging that whole region. Herbert and Arnulf I of Flanders joined Rudolph and together they took Eu, but were ambushed near Fauquembergues where the king was wounded, the Count of Ponthieu killed, and many Normans left dead on the field. Also in that year, Rudolph conversed with Louis the Blind, king of Provence, over the Magyars, the newest barbarian migrants to Europe, then menacing Louis. In 930 Magyars invaded the region around Rheims, but left before the king could engage them. In 935 Magyars invaded Burgundy and Rudolph brought a large army against them, causing their retreat without a battle. West Francia was temporarily safe from both Vikings and Magyars at Rudolphs's death. In order to increase his own power, Herbert II, Count of Vermandois used his royal prisoner as a bargaining tool to secure the archbishopric of Rheims for his son Hugh in 925 and the county of Laon for his son Odo in 927. The complaints from Rudolph led Herbert II to bring Charles before William Longsword, Count of Rouen (sometimes incorrectly dubbed "Duke of Normandy"), for homage and then to Rheims to press Charles' claim on Pope John X. In 928 Herbert II finally got possession of Laon, but the next year Charles died at Péronne and Herbert II lost his leverage against Rudolph. After defeating Vikings of the Limousin, Rudolph received the allegiance of the Aquitainians and homage from William Longsword, to whom he granted in 933 the islands off the coast of Normandy, now referred to as the Channel Islands. In 929 Rudolph attempted to reduce the power of Ebalus, Duke of Aquitaine. He withdrew from him access to Berry, and in 932 granted the title of prince of Gothia to the count of Toulouse, Raymond Pons, and his brother of Rouergue, Ermengol. He also transferred the title Count of Auvergne to Raymond. Moreover, the territory of the march which was under the control of the lord of Charroux was transformed into an independent county. Later, however, Rudolph was campaigning with Ebalus in the south to eradicate the last Viking strongholds there. He then proceeded aggressively against Herbert II, marching into Rheims and replacing Hugh with Artald in 931. Then, joined by Hugh the Great, Rudolph burned Herbert's fortresses and cornered him in Château-Thierry, where he had first imprisoned Charles, from 933 to 934. The two made peace in 935 and Rudolph fell ill, dying a few months later on 14 or 15 January 936. ^ Jean Dufour, Recueil des actes de Robert Ier et de Raoul, rois de France: 922–936 (Paris, 1978), p. lxvii. Gwatking, H. M., Whitney, J. P., et al. Cambridge Medieval History: Volume III—Germany and the Western Empire. Cambridge University Press: London, 1930. Laon is the capital city of the Aisne department in Hauts-de-France, northern France. 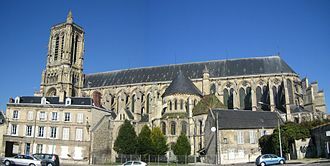 As of 2012 its population was of 25,317, the holy district of Laon, which rises a hundred metres above the otherwise flat Picardy plain, has always held strategic importance. In the time of Julius Caesar there was a Gallic village named Bibrax where the Remis had to meet the onset of the confederated Belgae. Whatever may have been the locality of that battlefield, Laon was fortified by the Romans. 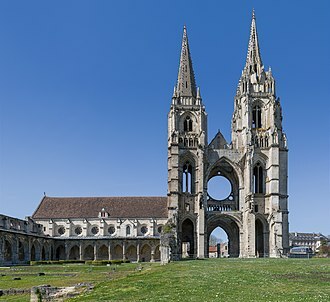 At that time it was known as Alaudanum or Lugdunum Clavatum, archbishop Remigius of Reims, who baptised Clovis, was born in the Laonnais, and it was he who, at the end of the fifth century, instituted the bishopric of Laon. Thenceforward Laon was one of the towns of the kingdom of the Franks. Charles the Bald had enriched its church with the gift of very numerous domains, in about 847 the Irish philosopher John Scotus Eriugena appeared at the court of Charles the Bald, and was appointed head of the palace school. Eriugena spent the rest of his days in France, probably at Paris, early in the twelfth century the communes of France set about emancipating themselves, and the history of the commune of Laon is one of the richest and most varied. 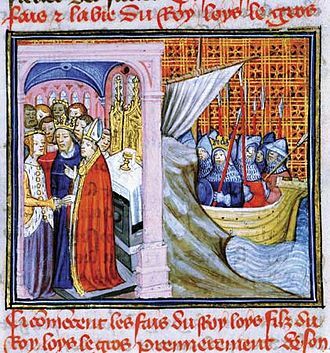 Anselm of Laons school for theology and exegesis rapidly became the most famous in Europe, the consequence was a revolt, in which the episcopal palace was burnt and the bishop and several of his partisans were put to death on 25 April 1112. The fire spread to the cathedral, and reduced it to ashes, uneasy at the result of their victory, the rioters went into hiding outside the town, which was anew pillaged by the people of the neighbourhood, eager to avenge the death of their bishop. 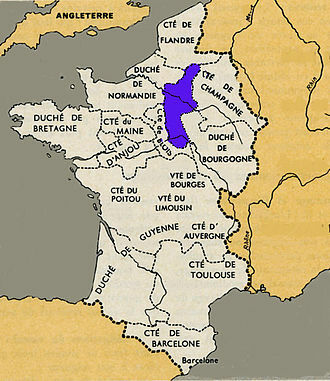 The king alternately intervened in favour of the bishop and of the inhabitants till 1239, after that date the liberties of Laon were no more contested till 1331, when the commune was abolished. During the Hundred Years War it was attacked and taken by the Burgundians, under the League, Laon took the part of the Leaguers, and was taken by Henry IV. At the Revolution Laon permanently lost its rank as a bishopric, during the campaign of 1814, Napoleon tried in vain to dislodge Blücher and Bülow from it in the Battle of Laon. Louis the Blind was the king of Provence from 11 January 887, King of Italy from 12 October 900, and briefly Holy Roman Emperor, as Louis III, between 901 and 905. He was the son of Boso, the king of Provence, and Ermengard. Through his father, he was a Bosonid, but through his mother and he was blinded after a failed invasion of Italy in 905. As a boy of seven, Louis succeeded to the throne of his father Boso, the kingdom Louis inherited was much smaller than his father’s, as it did not include Upper Burgundy, nor any of French Burgundy, absorbed by Richard the Justiciar, Duke of Burgundy. 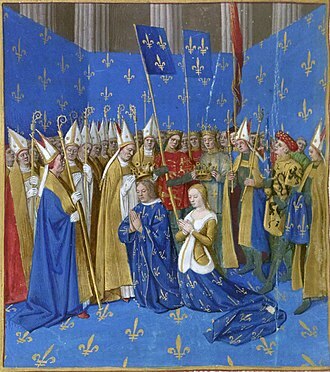 This meant that the kingdom of Provence was restricted to the environs of Vienne, the Provençal barons elected Ermengard to act as his regent, with the support of Louiss uncle, Richard the Justiciar. In May, Ermengard traveled with Louis to the court of her relative, the emperor Charles the Fat, Charles adopted Louis as his son and put both mother and son under his protection. In May 889, she traveled to the court of Charles successor, Arnulf, to make a new submission, the short work, Visio Karoli Grossi, may have been written shortly after Charles death to support Louiss claim. 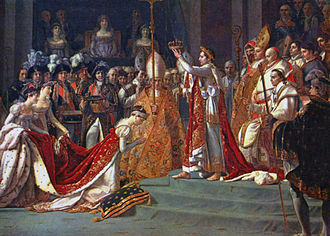 If so, Louis must have had the support of Fulk the Venerable, on the other hand, the Visio may have been written later, circa 901, to celebrate Louiss imperial coronation. In 894, Louis himself did homage to Arnulf, in 896, Louis waged war on the Saracens. Throughout his reign he fought with these Saracen pirates, who had established a base at Fraxinet in 889 and he travelled onwards to Rome, where, in 901, he was crowned Emperor by Pope Benedict IV. The next year, Berengar defeated Louiss armies and forced him to flee to Provence and promise never to return. In 905, after listening to the Italian nobles who were tired of Berengar’s rule. Once again throwing Berengar out of Pavia, he marched and succeeded in taking Verona with only a small following, after receiving the promise of support from the bishop, Adalard. Partisans of Berengar in the town soon got word to Berengar of Louis’s exposed position at Verona, Berengar returned, accompanied by Bavarian troops, and entered Verona in the dead of night. Melun is a commune in the Seine-et-Marne department in the Île-de-France region in north-central France. It is a suburb of Paris 41.4 km from the centre of Paris. Melun is the prefecture of the Seine-et-Marne, and the seat of an arrondissement. Meledunum began as a Gaulish town, Caesar noted Melun as a town of the Senones, situated on an island in the Seine, at the island there was a wooden bridge, which his men repaired. Roman Meledunum was a mutatio where fresh horses were available for official couriers on the Roman road south-southeast of Paris. The Normans sacked it in 845, the castle of Melun became a royal residence of the Capetian kings. 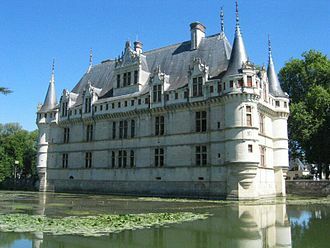 Hugh Capet gave Melun to Bouchard, his favorite, in the reign of Hughs son, Robert II of France, the count of Champagne, bought the city, but the king took it back for Bouchard in 999. The chatelain Gautier and his wife, who had sold the city, were hanged, Robert died there in July 1031. Donatus Bouchard I, Count of Vendôme and Count of Paris The early viscounts of Melun were listed by 17th and 18th century genealogists, such viscounts include Honoré Armand de Villars and Claude Louis Hector de Villars. Auxerre is the capital of the Yonne department and the fourth-largest city in Burgundy. Auxerres population today is about 39,000, the area comprises roughly 92,000 inhabitants. Residents of Auxerre are referred to as Auxerrois, Auxerre is a commercial and industrial centre, with industries including food production and batteries. It is noted for its production of Burgundy wine, including world-famous Chablis, in 1995 Auxerre was named Town of Art and History. 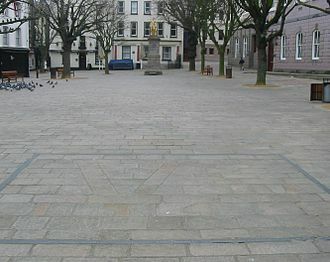 Auxerre was a flourishing Gallo-Roman centre, called Autissiodorum, through which passed one of the roads of the area. In the third century it became the seat of a bishop, in the 5th century it received a Cathedral. In the late 11th-early 12th century the existing communities were included inside a new line of walls built by the counts of Auxerre. Bourgeois activities accompanied the land and wine cultivations starting from the twelfth century. The Burgundian city, which part of France under King Louis XI, suffered during the Hundred Years War. In 1567 it was captured by the Huguenots, and many of the Catholic edifices were damaged, the medieval ramparts were demolished in the 18th century. In the 19th century numerous heavy infrastructures were built, including a station, a psychiatric hospital and the courts. Up until recently, Auxerre was one of the most prosperous cities in the country, in Gothic style, it is renowned for its three doorways with remarkable bas-reliefs. The stained glass windows in the choir and the chapel are among the finest in France. The 11th century crypt houses the remains of the former Romanesque cathedral, abbey of Saint-Germain, existing from the ninth century. The crypt has some of the most ancient mural paintings in France, interesting are the chapter room, the cellar and the cloister. The Clock tower, located in the Old Town The church of St. Pierre en Vallée, in the style of late Gothic architecture, it has a tower similar to that of the cathedral. Portions of the decorations and inner chapels were financed by local winegrowers, church of St. It can refer to John X of Antioch. Pope John X can refer to Pope John X of Alexandria, Pope John X was Pope from March 914 to his death in 928. A candidate of the Counts of Tusculum, he attempted to unify Italy under the leadership of Berengar of Friuli and he eventually fell out with Marozia, who had him deposed and finally murdered. John’s pontificate occurred during the known as the Saeculum obscurum. John X, whose name was John, was born at Tossignano. He was made a deacon by Peter IV, the Bishop of Bologna, where he attracted the attention of Theodora, the wife of Theophylact, Count of Tusculum, the most powerful noble in Rome. It was alleged by Liutprand of Cremona that John became her lover during a visit to Rome, regardless, it was through Theodora’s influence that John was on the verge of succeeding Peter as bishop of Bologna, when the post of Archbishop of Ravenna became available. He was consecrated as Archbishop in 905 by Pope Sergius III, during his eight years as archbishop, John worked hard with Pope Sergius in an unsuccessful attempt to have Berengar of Friuli crowned Holy Roman Emperor and to depose Louis the Blind. 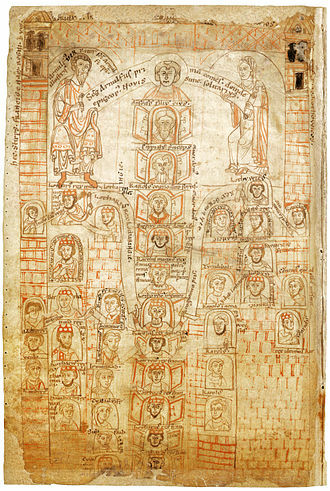 After the death of Pope Lando in 914, a faction of the Roman nobility, headed by Theophylact of Tusculum, whilst Theophylact was alive, John adhered to his patron’s cause. The first task that confronted John X was the existence of a Saracen outpost on the Garigliano River, which was used as a base to pillage the Italian countryside. John consulted Landulf I of Benevento, who advised him to help from the Byzantine Empire, and from Alberic, marquis of Camerino. John took his advice and sent Papal legates to King Berengar of Italy, various Italian princes, as well as to Constantinople, the result was a Christian alliance, a precursor to the Crusades of the following century. Meanwhile, Berengar brought with him troops from the parts of Italy, and the campaign was coordinated by John X. After some preliminary engagements at Campo Baccano and at Trevi, the Saracens were driven to their stronghold on the Garigliano. There, at the Battle of Garigliano, the allies proceeded to lay siege to them for three months, at the end of which the Saracens burnt their houses and attempted to burst out of the encirclement. Melun water-color postcard showing Melun in the 1920s and circa 1095.